the mob for prostitution and drugs. But Lily’s usual laser-like focus on the case has been disrupted. pregnancy a secret from her colleagues. local mob boss only to find out her suspect is also wanted by them. are shot at, and another body is found. Detective Ariel Weeks is working undercover to being the mob down on charges of prostitution and drugs. But just before she is done she is discovered murdered. Lily gets the case and with her new partner Jeremiah Mills. But Lily is still shaken from learning of her pregnancy and discovering the ultimate betrayal of her husband. She decides to have a meeting with the mob when she learns that her suspect is also someone the mob boss is looking for. But the more Lily learns the more she feels alone. Her partner has connections to the mob and Ariel may still be alive if not for Assistant District Attorney Ibee Walters. I really liked Her Final Watch. Lily is shaken after her last case but has to get on with the new investigation. But this is not going to be a simple case when it is clear the mob bosses son is out for revenge. Plus Lily has a huge distraction with her pregnancy, should she keep the baby of a murderer? 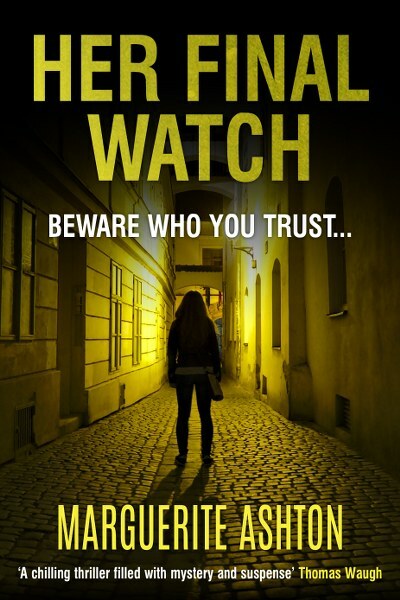 With a great story that will keep you guessing, lots of twists and turns, and a strong female lead, I would say that Her Final Watch is a great mystery thriller. I loved every moment of it and can’t wait to read the next book in the series. Lily knows her sister’s killer is back. discovers the body of another young woman. at work, and CtryGeek23 is the mastermind. discovers she may not be who she thinks she is at all. Lily Blanchett wants nothing more than to follow in the footsteps of her detective father. But after the murder of her sister Celine, nothing is the same. Her parents are about to be divorced and Lily married a reporter that she barely knows. Then she gets the case of two girls that have been murdered in a similar way to her sister. Lily starts looking into the deaths and comes across the online profile CtryGeek32. It seems that the killer has been using this profile to get the girls he murders. But the more Lily digs up, the more trouble she is in. It seems she is closer to the killer than she knows. This was a great story with lots of twists and turns that kept me guessing. Of course you have some seriously dark secrets and lots of drama on the job, at home, and with her family. Lily is hyper focused on the investigation and determined to bring justice to her sister’s killer. This is a great mystery thriller that kept me engaged and has me curious about where Marguerite Ashton is going to take Lily in Her Final Watch. 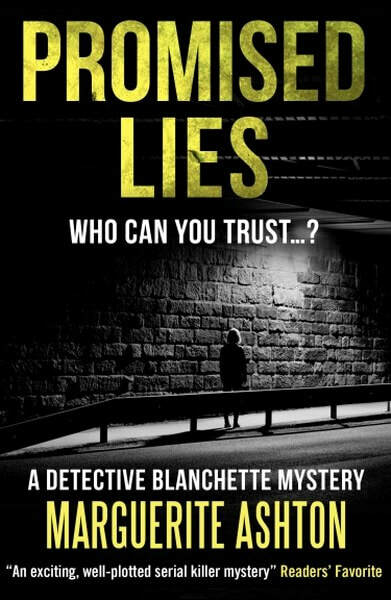 One of my favorite characters is Detective Lily Blanchette in Promised Lies. She’s got a lot going on. So, I’d like to think about what a day in Lily’s life would be like if her life weren’t in so much chaos. My main character Lily is a workaholic like her dad, Collin. She works at a medium-sized police station in rural Wisconsin with her best friend and partner, Morgan. Between chasing leads—the coffee shop and McGinley’s Irish Pub is the local hangout for law enforcement professionals when they need to relax and blow off steam. At home, she wakes up with her new husband. They are still getting to know each other’s personal spaces in their marriage. If her husband has time in his schedule, he tries to impress his wife with his culinary skills while she focuses on her latest remodeling idea for her Victorian home. When writing my books, if an idea for another book hits me, I jot it down in one of my many notebooks. When it’s time to go over the notes, I talk it out with my husband. For the law enforcement side, I contact my cop friends to see if I can get away with the story line. Sometimes I’ll be editing one manuscript, or working on the latest promo and the idea hits, and I write the scene. But it helps me to let it flow, then organize it later. The arts and becoming a foster mom for dogs until they find their forever home. Being a writer isn’t easy. Our job is to write every day and be prepared to repeat the process of creating a book over and over. My tip to writers is to give it your ALL. A – Ask questions about yourself and your writing. Make sure that this is something you want to do. L – Listen to the answers. Sometimes the reply is not what you’d expect or want to hear. L- Learn from those answers. Then take the appropriate steps to master your art. What is your writing process? For instance, do you do an outline first? Do you do the chapters first? When writing my books, if an Idea for another book hits me, I jot it down in one of my many notebooks. When it’s time to go over the notes, I talk it out with my husband. For the law enforcement side, I contact my cop friends to see if I can get away with the story line. Sometimes I can be editing one manuscript, or working on the latest promo and the idea hits, and I write the scene. But it helps me to let it flow, then organize it later. It’s a process…Writing Her Final Watch was tricky. I had to find a way to work Lily’s pregnancy in the story and allow her to work in the field. That’s when I turned to my friends in law enforcement. They helped me understand what my heroine, could and couldn’t do. After I did my research, I put myself in Lily’s shoes and focused on what would be important to her. No matter how much she loved her job, her motherly instincts would kick in. And I think I’ve managed to find a balance between the two. For me, there was never that one moment. I had several. A lot of it had to do with my self-doubt as I tried to decide if I was making the right decision. My strong desire to write was something I felt from the inside. For me, I have to write every day. Even if it’s just making notes on another book or working on my blog. If I miss more than a day, I start to get cranky. The one thing that keeps me writing is David Baldacci. His story helped remind me that success can come with persistence and continual improvement. Coming up with a title for any of my books is a process. I’ve tried to make it easier, but I haven’t had any luck. I write down the first words that come to my mind and start crossing out the ones that don’t work for me. If I run out of suggestions, I go to my husband or mentor. It took me three days to come up with Her Final Watch. Promised Lies took a year. Endeavour Press designed Promised Lies and Her Final Watch. Judy Bullard is the designer for my YA mystery series. Yes, I do see writing as a career. It’s very important to me and the challenges that come along with it. No, I wouldn’t change anything. In fact, it kept me focused on what to write in my upcoming book, The Parolee. Gabrielle Union as Detective Lily Blanchette. 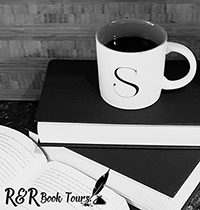 I want to thank you for giving Detective Lily Blanchette a chance to invade your personal reading space. I received both Promised Lies and Her Final Watch from Silver Dagger Book Tours for free. This has in no way influenced my opinion of these books. Thank you, Jessica, for your time. 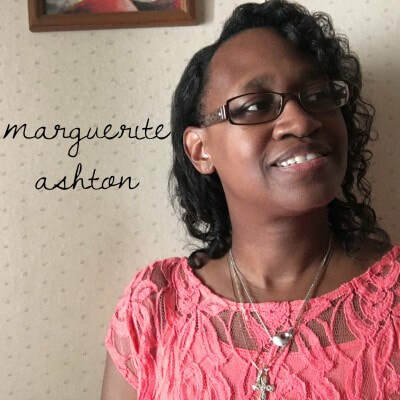 I appreciate you hosting me on your blog! You are very welcome. Thank you for some fantastic stories.